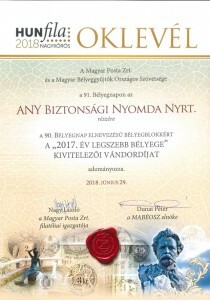 National Association of Hungarian Stamp Collectors – based on its members’ votes and with the support of Magyar Posta Ltd. – has awarded the ’MOST BEAUTIFUL STAMP OF 2017’ Challenge Cup to ANY Security Printing Company PLC for the 90th Stamp Day Stamp Block on the occasion of the 91st Stamp Day organized this year. 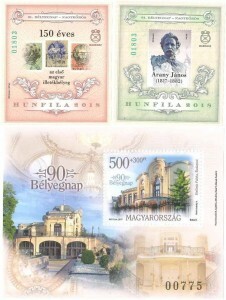 Between 29th June and 1st July 2018 Nagykőrös hosted the events of the 91st Stamp Day and the HUNFILA 2018 – 650TH ANNIVERSARY OF NAGYKŐRÖS, TOWN OF JÁNOS ARANY National Stamp Exhibition; one of the patrons was Gábor Zsámboki, CEO of ANY PLC. Both the souvenir stamp set and stamp block depicting sights of the 650-year-old Nagykőrös this year, as well as the souvenir sheet to be issued by Magyar Posta Ltd. in honor of the famous son of the town, János Arany, were manufactured by the machines of ANY PLC. The special feature of the souvenir sheet is the Braille inscription “Stamp Day” in the bottom of the frame. It is also interesting to us that the fee stamp issued 150 years ago which was released in Hungary for the first time but still manufactured in the Viennese State Printing House was greeted by the Association with a souvenir sheet. Our special printing technology is also reflected in the field of stamp production, since The Herb of the Year 2018: Real Lavender stamp with its lavender-scented capsule causes a pleasant surprise for the stamp collectors when touching the surface of the stamp.